Scottish Water has issued advice on how to deal with "discoloured water" after service was restored to Dundee homes. Water supplies are being disrupted in parts of Dundee this morning. Scottish Water works to renew 55 miles of piping across Dundee have finally come to an end. A string of local businesses believe they will face disruptions and a drop in trade as a two-week closure looms. 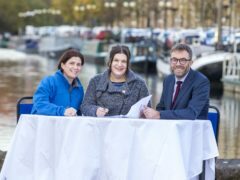 Work has begun on what is said to be Europe’s first ever “smart canal” scheme, using the 250-year-old Forth & Clyde Canal. A blocked drain is costing a pub manager a fortune – and causing a stink for shoppers and traders in the surrounding street. Scottish Water has apologised for the delays to the city’s £5 million network upgrade, and repeated its pledge to finally complete the project by the end of the summer. Charleston residents spent hours on one of the hottest days of the week without water after a mains pipe burst. The completion of a £5 million Dundee-wide water network upgrade has been delayed for a second time. After 42 years of service, a water industry veteran has finally retired. Motorists have been warned to prepare for disruption as three weeks of roadworks on key Dundee routes got under way.